Your landscape trees and shrubs are very likely to struggle b/c they exist in an urban environment. Trees in the forest receive the benefit of everything that decomposes into the forest floor. It’s obvious that most trees in the urban environment are deprived of most of these nutrients. Struggling trees are extremely susceptible to detrimental secondary problems such as pests, fungi, and bacteria. 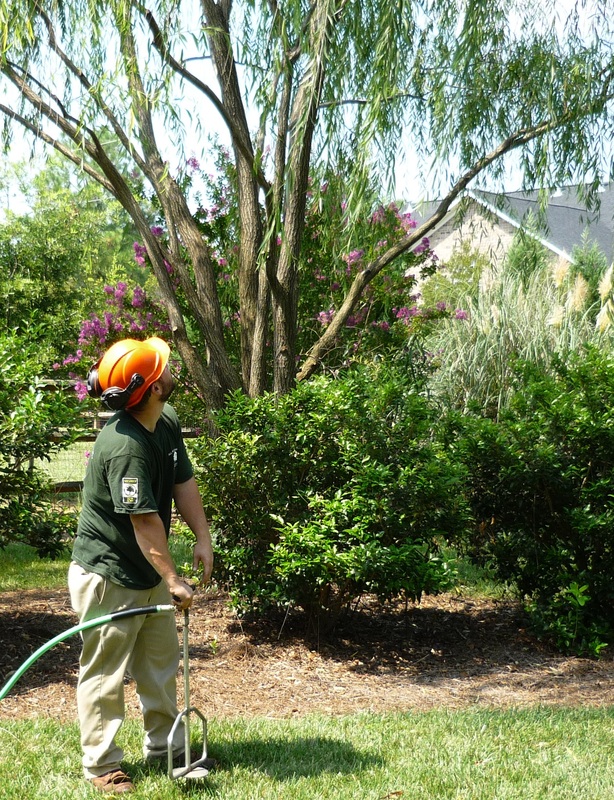 At AAA Tree Experts, we have the knowledge and ability to actually improve the ecosystem of your yard so that your plants can thrive, flourish, and have lasting health. Our state of the art fertilization truck and deep root injection equipment allow us to literally put life into and “reforest” your soil, creating a sustainable environment that will benefit your plants in an extremely effective and truly vital way. Our trunk injection materials and techniques can give your trees the boost they need to function healthily for extended periods of time. We offer organic and environmentally friendly solutions that provide sustainability to your landscape’s ecosystem. In the picture below, it’s easy to see that this Weeping Willow has very little organic matter decomposing into its root zone. Many of its absorbing roots are actually competing with grass and some shrubs. Treating this soil with a highly effective mixture of nutrients was a great move on this property owner’s part!! At AAA Tree Experts, we love trees and want to do our utmost to insure and promote their health. Please call 704-366-1134 or click here so that we can schedule a time to evaluate your tree care needs! !